This page provides advice in the selection of audio equipment for the recording of speech. There has perhaps never been as wide a variety of equipment available for making audio recordings as there is today. There are analogue recorders, digital recorders, tape recorders, disk recorders and memory recorders, not counting laptops and PDAs. This page aims to help you make sense of the confusion so that you can make an informed decision about what recorder to use or to buy for your purposes. The advice is directed at students, researchers, speech therapists and other professionals working with spoken language. It deals mainly with portable equipment suited to making recordings in the field and at the budget end of the price range (the most expensive recorder here is £650). This means that much professional recording equipment used within the broadcasting and recording industry is not included. The goal has been to put together a selection of equipment that is capable of making good quality recordings that are suited to signal analysis, for example the computer analysis of voice quality, fundamental frequency and formant frequencies. In fact the audio recording equipment available today is of such good specification that is makes sense to try to ensure that all speech recordings are of sufficient quality for instrumental analysis. This means taking care about the choice of microphone, the recording environment, and the recording settings as well as the choice of recorder. For each type of recorder, the basic means of operation is described, some of its advantages and disadvantages are outlined, and one or more models are highlighted. Cassette recorders make analogue recordings onto compact cassettes containing 1/8" tape running at 1.875 inches/sec. Modern recorders have an acceptable frequency response for speech recordings, but typically have a poor signal-to-noise ratio. The poor SNR means that cassette recorders are unforgiving about incorrectly set recording levels - quiet recordings are very noisy. The analogue technology brings its own problems of course: significant harmonic distortion, loss of quality with storage and the problems of recordings being affected by drop outs and media damage. Although they can make good everyday recorders for speech, they are being replaced by minidisc recorders and are increasingly hard to find in the shops. The portable cassette recorder of choice in the 1990s was the Sony Professional Walkman (see picture on right). There were various models, but the WM-D6C was considered by some to be the best. I believe that these are no longer manufactured, but you may be able to obtain one on eBay for about £100. If you find another make of portable cassette recorder on sale, check for an external microphone input and a manual record level control. General advice on the use of audio cassettes for recording include: to use new Type II (Chrome) tapes for each recording, to use Dolby noise reduction when instrumental analysis is not required, and to take care in the setting of recording levels (too high and significant distortion occurs, too low and poor SNR results). Minidisc recorders make compressed digital recordings on 2.5" magneto-optical disks. The disks are protected in a cartridge. Recordings are made using the ATRAC compression system developed by Sony. Minidisc recorders are extraordinarily small and light and capable. However their small size can make them fiddly to operate. 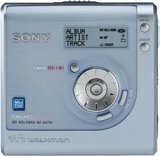 Minidisc recorders are designed to prevent users making perfect digital copies of copyright recordings, so you cannot gain access to the compressed bit stream directly - you must always decompress and recompress, and this process loses quality. Few minidsc recorders have a digital output, so to obtain a digital transfer to a computer, you will also need a minidisc deck with a digital output and a PC with a digital audio input. There is an ongoing debate about whether the ATRAC compression scheme makes any important difference to speech recordings which would influence instrumental analysis. Given that the scheme is essentially a time-domain coding applied to different frequency bands, it is likely that pitch would not be affected by coding, however there is no guarantee that the spectral envelope (and hence formant frequencies) would not be affected. Although it is likely that changes would only be small, the real problem is that you don't know in any single case what effect the compression has had on the recording. It is this indeterminacy that is worrying. You can read all there is to know about minidisc at minidisc.org. A recent innovation in minidisc recorders is the HiMD recorder. These are interesting in two respects: firstly they use larger capacity disks and can record an hour of audio even in an uncompressed format, and secondly they have a USB interface which can be used to upload recordings to a computer (providing they were made on that recorder using an analogue input). Digital Audio Tape (DAT) recorders make digital recordings on 6mm tape cartridges, using a modified video recording mechanism with a rotating tape head. DAT recorders have been used widely in professional broadcasting because of their capability for making high quality recordings. DAT recorders record stereo 16-bit linear PCM digital signals at either 44100 or 48000samples/sec. DAT recorders usually have some kind of digital output stream capability so that recordings can be transferred digitally to a computer system. For more information about DAT, visit the DAT Heads site. Professional DAT recorders cost more that £1000, but a small number of compact, "prosumer" models are available in the £500-600 range. 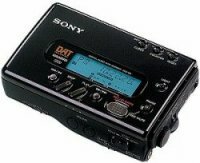 For example, the Sony TCD-D8 (pictured right) is a Walkman sized DAT recorder that retails for about £650. One worry about DAT recorders is the complexity of the rotating head and tape transport mechanism. These devices are probably relatively fragile, and this means that DAT recorders should be transported with care and regularly maintained. 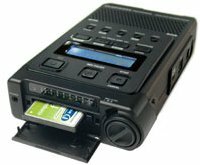 Solid-state recorders make digital recordings onto memory cards, such as compact flash cards. Usually they have an option to save as uncompressed linear PCM or in a compressed format such as MP3. For a given size of memory card, you can record for longer using a compressed format but at a lower quality. It is recommended that data rates of at least 192kbps are used for good quality speech recordings intended for computer analysis. One hour of an uncompressed monophonic 16-bit 44100samples/sec recording occupies about 320MB. At 192kbps compression, it would occupy about 90MB. Compact flash card memories are available in different sizes, with a 1GB memory card currently about £100. The Roland Edirol R-1 recorder is due to be launched in 2005 (see picture on left). It can record in linear PCM and MP3 up to 320kbps onto Compact Flash memory cards up to 2GB in size. 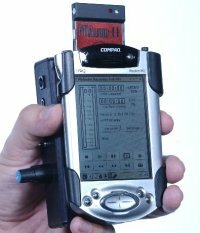 The R-1 recorder should retail for about £400 with a 64MB compact flash card. At the professional end of the marked come the Marantz and Fostex solid-state recorders. The Marantz PMD670 model is sold as a DAT replacement system, for about £750. The Marantz PMD660 (pictured right) is a new cheaper version of the PMD670, which should retail for about £400. Hard-disk recorders make compressed or uncompressed digital recordings onto high-capacity disk drives inside the recorder. Recordings must then be copied from the recorder onto permanent media, such as CD or computers. Hard-disk recorders are a new type of recording device. Although the number of available models is still small, this is bound to be an increasing segment of the market. Professional hard-disk recorders are still very expensive and typically not designed for portable use. However, there are an increasing number of portable music players, originally designed for playing compressed music recordings, that are now being sold with the capability of making live recordings through an external microphone socket. 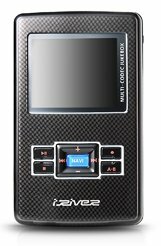 One such recorder is the iRiver H300 series audio player (H340 pictured right). This product has a 20 or 40GB hard disk and can make real-time recordings from an external microphone using MP3 compression at 320kbps. Recordings can then be uploaded to a PC using its USB interface. Retail price is about £320. Laptop computers can be used to make digital recordings if they are equipped with an external microphone input of sufficient quality. Unfortunately almost all laptops have poor quality microphone inputs - they are often very noisy and can be too insensitive for good quality microphones. This means that laptop users need to purchase a separate audio interface. These are typically separate devices containing a microphone pre-amplifier and an analogue to digital converter with a digital interface to the computer. However also note the introduction of USB microphones below. Perhaps the best interfaces are USB powered and designed for use with professional microphones. The M-Audio MobilePre USB interface (pictured right) supports XLR and 3.5mm microphone connections, supplies phantom power for condensor microphones and has good specifications in terms of noise and distortion. This retails for about £130. If you are planning on using a laptop for speech recording, you may also be interested in the free ProRec - Prompt & Record application. This application runs on the laptop and presents wordlists or pictures to the client at the same time as making a recording. ProRec creates not just an audio file but also an index file which identifies which slides were being shown at which time in the recording. Palm-top computers or PDAs could well become the basis for an ideal portable recording system in the future. They are smaller, lighter, and less expensive than a laptop, but have superior battery life and are well equipped with memory and network interfaces. At present, however, not all PDAs have an external microphone input; and of those that do, the quality of the microphone input is unknown for our purposes. We await further testing. The microphone inputs of PDAs tend to be constructed for "voice recording", i.e. with the quality of dictation machines rather than for good quality audio. They are often designed for combination microphone and headset use for telephony. Ideally someone would build a Compact Flash compatible audio interface designed for external microphones with a good quality pre-amplifier and analogue-to-digital converter. The nearest product we have is the Core Sound PDAudio-CF (see image on right) which is a digital audio interface for PDAs that can be purchased with an external box containing a microphone pre-amp and an analogue-to-digital converter for about $750. Once you have chosen your audio recorder, you must select appropriate microphones which match not only in terms of connector but also in terms of quality. There is little point using a high-quality recorder and poor-quality microphones. Dynamic microphones are versatile and ideal for general-purpose use. They use a simple design with few moving parts. They are relatively sturdy and resilient to rough handling. They are also better suited to handling high volume levels, such as from certain musical instruments or amplifiers. They have no internal amplifier and do not require batteries or external power. Condenser microphones require power from a battery or external source (called "phantom power"). The resulting audio signal is stronger signal than that from a dynamic. Condensers also tend to be more sensitive and responsive than dynamics, making them well-suited to capturing subtle nuances in a sound. They are not ideal for high-volume work, as their sensitivity makes them prone to distort. Condenser means capacitor, an electronic component which stores energy in the form of an electrostatic field. The term condenser is actually obsolete but has stuck as the name for this type of microphone, which uses a capacitor to convert acoustical energy into electrical energy. The electret condenser microphone uses a special type of capacitor which has a permanent voltage built in during manufacture. This is somewhat like a permanent magnet, in that it doesn't require any external power for operation. Therefore you don't need to worry about batteries or phantom power. Other than this difference, you can think of an electret condenser microphone as being the same as a normal condenser. Microphones may be supplied with many different connectors. Check that the microphone you order matches your recorder! Otherwise you may need to seek out various conversion cables and adapters. XLR connectors are used on professional microphones. They have two "balanced" signal lines per microphone and an earthed shield. They provide the best resistance to electrical interference. Mini XLR connectors are used on "lavalier" or lapel microphones. The miniature microphone element is connected through a fine cable to the mini XLR which connects to a battery box or radio transmitter. The other side of the battery box may have XLR or 1/4" jack connectors. 1/4" (6.5mm) mono jacks are also popular for professional microphones. 1/4" (6.5mm) stereo jacks are sometimes found on stereo microphones. 1/8" (3.5mm) mono jacks are popular for consumer microphones. 1/8" (3.5mm) stereo jacks are sometimes found on consumer stereo microphones. 3.5mm 4-pole mini jacks are used for telephony headsets which incorporate stereo headphones and a mono microphone. They tend to be found on PDAs. A classic style of microphone for speech recording in interview situations is a hand-held dynamic cardioid microphone. Ever popular for singers is the Shure SM58 (pictured right), a microphone tailored for vocalists. Price about £85. An entry level hand-held dynamic cardioid microphone with a good specification is the AKG D50S (pictured right). This retails for about £30. Lapel microphones are typically condensor or electret based operation, requiring an external power supply. The AKG C417 is a popular budget-priced lapel microphone which requires a separate AKG B29L battery box to supply power. Different versions are equipped with standard or mini XLR connectors and come in different flesh tones! The microphone retails for about £50, while a battery box is £30. USB microphones are an exciting new type of microphone product. The Samson C01U microphone (pictured right) is equipped with a USB connector for direct connection to a computer. This avoids the need for the external USB audio interfaces described in the section on laptops. The Samson C01U microphone retails for about £69.